The UFC returns to England, live from the The O2 Arena in London. The last event to take place in England was of course UFC 204, where Michael Bisping defended his Middleweight title against Dan Henderson. While Henderson dropped Bisping several times in the bout, the judges ultimately would award Bisping the victory. It was only the second decision of the night, something that the fans hope repeats itself for UFC Fight Night 107. Headlining UFC Fight Night 107 is two top ten Light Heavyweights in the form of Corey Anderson and Jimi Manuwa. Anderson, comes into this bout on the heels of a dominant TKO victory over Sean O’Connell. The victory got Anderson back in the win column after previously losing to Mauricio “Shogun” Rua via a controversial split decision. As for Manuwa, his most recent fight was a victorious one. He defeated Ovince St. Preux via second-round knockout, in which was by far his best performance inside the octagon. The winner of the this fight is in good hands, as they instantly will emerge as a contender in a shallow Light Heavyweight division. Co-Headlining the card is a welterweight contest between two rising talents in the form of Gunnar Nelson and Alan Jouban. Touted as a future champion, Nelson hasn’t quite lived up to those expectations. His UFC tenure started out 4-0, but he has since traded wins and loses. I can’t blame entirely blame Nelson though, as losses to Rick Story and Demain Maia you can chalk up to veterans having more experience and had a better skill-set at the time. As for Jouban, he’s been very impressive of late, currently riding on a three-fight win streak. His last fight came against the undefeated Mike Perry, who had knocked out all of his opponents including two within the UFC. Jouban effectively kept his distance and pieced up Perry from afar earning a clear unanimous decision in the process. At 35 years of age, Jouban needs to win this to keep his title dreams alive. And for Nelson, a two-fight win streak would help him finally rise the ranks. 205 lbs. 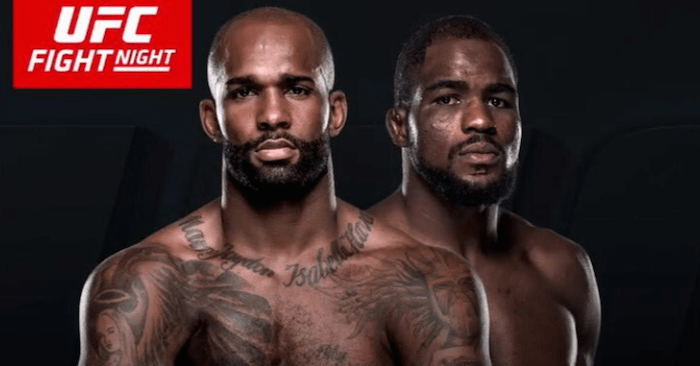 : Jimi Manuwa vs. Corey Anderson – This isn’t exactly main event material, but it’s an intriguing fight in terms of the Light Heavyweight division. The winner conceivably is a contender and due to the shallowness of the division, perhaps gets a title eliminator fight next. So with the stakes high and I’m sure both men know to a degree, I expect this a very cautious fight. I think especially with this being five rounds, Manuwa is going to want to be conservative and pick his shots. I mean, if he’s aggressive early and he can’t get the finish, it’s going to be a long day. Anderson has cardio for days and he keeps a solid pace throughout the fight. As for a prediction, I have Anderson. I think Manuwa is a solid striker, but he can be Jekyl & Hyde sometimes. Against OSP, he looked amazing and to be a legit threat in the division, but against Blachowicz, he looked sluggish to say the least. Anderson has been consistent and hadn’t Gian Villante landed a punch in the third round that wobbled Anderson or the judges not side with “Shogun” Rua, then Anderson would probably be fighting for the title. That might be a stretch, but maybe not with the division in shambles. Anyways, I have Anderson to weather anything Manuwa offers early and eventually finish him via TKO. 170 lbs. : Alan Jouban vs. Gunnar Nelson – I already broke this down somewhat earlier, so I’m a keep this light. Jouban wants to keep this fight on the feet and use his distance like he did against Mike Perry. Nelson will probably oblige and strike with Jouban early, but if he’s not doing well in the striking department, he’s going to resort to using his superior grappling. With Jouban’s route to victory only coming by way of out striking Nelson, I can’t side with him. I think Nelson’s grappling is the difference and in the third round, I see him submitting Jouban. 135 lbs. : Brad Pickett vs. Marlon Vera – In Brad Pickett’s retirement fight, did you think there was any way I was going to pick against him? This is going to be an awesome fight for him in his hometown of London and I firmly believe he’s going to do anything to win. He’s got to get inside and not let Vera keep distance. If he can mix in some takedowns too like he’s capable of, this should be relatively easy. However knowing Pickett, he’s going to keep this on the feet and prove to be the better striker. I concur that he is and have him winning via decision. 145 lbs. : Arnold Allen vs. Makwan Amirkhani – This is your “FOTN”, as you have two rising stars, both in which are undefeated in the UFC fighting each other. Stylistically, this is a tough fight to call, as I’d say they have more similarities than differences. However, if I were to make a call, I’d favor Amirkhani. I believe he’s going to be the stronger grappler and training at SBG is going to improve his striking. Allen might have the edge in cardio, but I expect Amirkhani to take the first two rounds and win this via decision. 155 lbs. : Joseph Duffy vs. Reza Madadi – This will be Duffy’s last fight on his UFC contract and it’s going to be a must win in order to raise his purse demands. It’s not a relatively dangerous fight either, as Madadi is pure grappler, who relentlessly will attempt take downs. Duffy is a crafty striker and submission expert and I think Madadi’s style just walks right into a finish at some point. Let’s call it the first round and via a submission. 205 lbs. : Francimar Barroso vs. Darren Stewart – The first fight between the two eventually got changed into a no contest, as a headbutt led to a TKO victory by Darren Stewart. However, from what I saw in the first fight, I expect no different. Stewart is going to crack Barroso and finish him within the first. 265 lbs. : Timothy Johnson vs. Daniel Omielanczuk – This is going to be a sloppy fight and I can’t see how 50% of this fight doesn’t take place on the cage. That’s where both these fighters live, as the like to grind down there opponents and take them down. Whoever has the better cardio will be factor too, as both these heavyweights lack finishing power. As for a prediction, I’m going with Tim Johnson. I think he’s slightly the better grinder and will have slightly better cardio en route to a very close decision victory. 155 lbs. : Marc Diakiese vs. Teemu Packalen – Albeit a close fight against Frankie Perez, make no mistake, Diakiese is the future. His striking is dynamic and precise and I really think he’s going to showcase that in this fight. While massive at 6’1, Packalen hasn’t fought anyone like Diakiese and won’t be ready for the striking. So with that, I got Diakiese via first round knockout. 170 lbs. : Oluwale Bamgbose vs. Tom Breese – Tough fight for Bamgbose, as he likens the fight to be contested on the feet. He’s a dangerous striker, as he carries legit power in those cinder blocks of hands. However, Breese is going to take him down and wear him out just like Cezar Ferreira did. And in the later rounds, Breese is going to lock in a submission and get the tap. 170 lbs. : Leon Edwards vs. Vicente Luque – Fun Fight! I’m excited for this one, as you have two young fighters with good UFC experience and success thus far. Edwards, is coming off a really impressive submission victory over Albert Tumenov. I’ll admit, I didn’t think he had a shot, let alone would be able to plant Tumenov on his back and finish him. As for Luque, since losing to Michael Graves in his debut, he’s stringed off four straight victories. The last two have come by knockout and I’ve been super impressed by his striking. As for a prediction, I’ve Luque via TKO. I really think his striking is going to stifle Edwards en route to a finish, but again, this is a fun between two similarly talented fights. 135 lbs. : Brett Johns vs. Ian Entwistle – I refuse to pick Entwistle here. He’s a literal one-trick pony, in which all he attempts is leg locks. He’s got no setup and the intent is known he’s going for your leg. With a 1-2 UFC record, that one-trick is going to have to go elsewhere when Brett Johns TKO’s him. 185 lbs. : Scott Askham vs. Brad Scott – This is literally a coin flip. I was once impressed with Askham, as he utilized knees especially in the clinch amazingly. However, he sometimes gets lulled into brawls and looks like a punching bag at times. Scott, trades wins and losses like no other and is due for a win here. However I already flipped a coint and it went in a favor of Askham. 135 lbs. : Lina Lansberg vs. Lucie Pudilova – I’ve only seen Lansberg fight against Cris Cyborg, which was pretty brutal. However, I have no idea about Pudilova other than she already lost to Lansberg early in her career. So with that, I got Lansberg via decision.